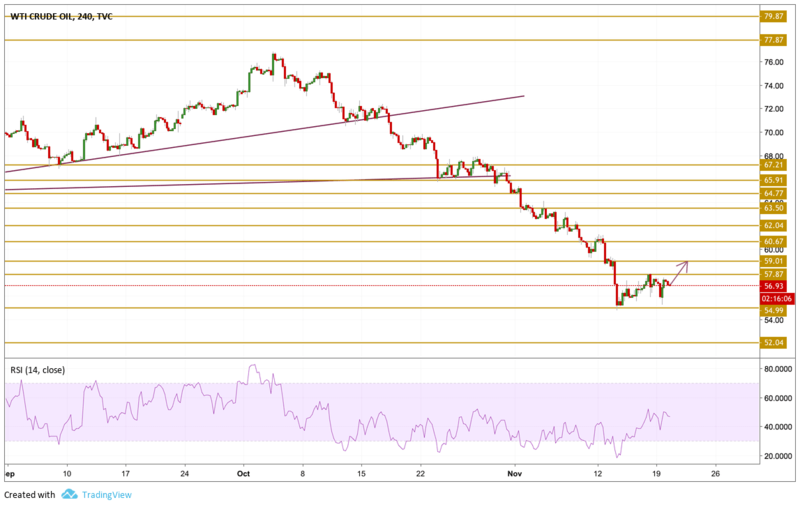 Crude oil prices started the week on a positive note and extended their recovery rally before reversing direction in the second half of the day. The barrel of West Texas Intermediate was able to settle at the end of the day just below the $57 level. Following a 12-day losing streak, crude oil gained traction last week as various OPEC officials said that OPEC+ was planning to introduce an additional output cut of 1- 1.4 million barrels per day to help the oil market find balance. However, Bloomberg reported that Russia wanted to watch the markets before agreeing to more supply reductions in the last OPEC meeting of the year in Vienna in December. Crude oil prices were unable to break above the $58 level despite gaining some traction during yesterday’s session. The price is currently hovering just below the $57 level with a neutral momentum. We will be watching the $59 resistance level today if a new wave of buyers shows up.